On Friday it is World Teacher’s Day and we are celebrating our wonderful teachers and trainees this week. First up is Gary Wade, a BA Primary Education student who is currently starting his second year at CCCU. Gary comes from Sittingbourne and comes from a background in retail management. Upon being made redundant, Gary became a stay at home dad. 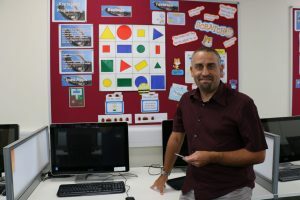 It was through a voluntary position at his children’s school and conversations with teachers and parents that he decided that he would pursue a career as a teacher. “I chose Christ Church because it was well-recommended for teacher training and my head of school recommended it to me. It is in easy driving distance from home. I like all the different aspects of studying here. Every day we do something different. We have lots of different tutors and different settings. I love where we are and all the things we do. I love the variety on the course. I went into Primary because of the variety that is available to me. I love that every day you go into a primary school classroom and it is very different. It is tricky to balance family and university life. I really use the time I’m not busy so get up early or stay up late to study. I have really enjoyed it. It has been busy but you can have a balance. There are periods between seminars to be able to get things done so it is very helpful. My personal tutor is really laid back, really supportive. I’m considerably older than most of the course which was very daunting. No one really takes any notice of who’s what. We work in groups with lots of different people. I knew I was going to be twice the age of many of the people in the room and I thought I was going to be the odd one out but from the moment I walked into the corridor when I started university people were really friendly. Thank you very much to Gary for sharing his experiences so far.